After an unsuccessful attempt at capturing Razar and Toka, the Turtles return to the lair to see the eccentric billionaire, A. J. Howard, spouting his ideology and his hatred for mutants across the airwaves. 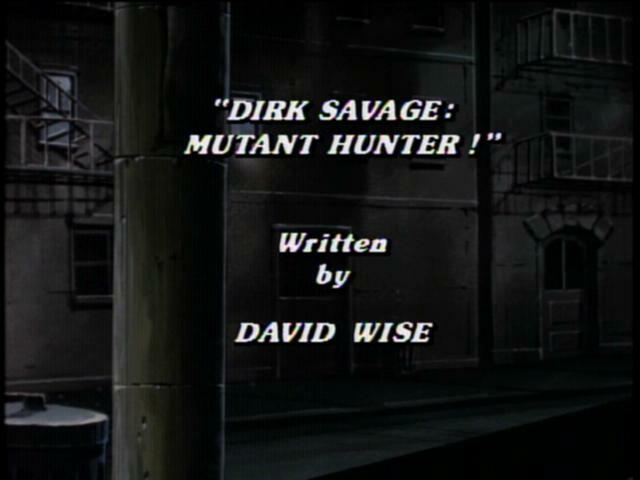 He ends his missive by introducing Dirk Savage, a mutant hunter, and announcing an 800 number for viewers to call in their mutant sightings and order their “DOWN WITH MUTANTS” bracelets. Dirk Savage’s first victims are Napolean Bonafrog and Ghengis Frog, two of the Turtles’ old buddies from the Everglades, and the hapless victims of bad vacation planning. 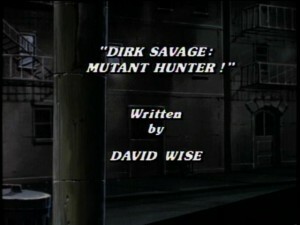 Back at the lair, Splinter suggests that while Dirk Savage is their greatest enemy, he may well be their greatest ally. It is up to the Turtles to demonstrate that not all mutants are evil. After Leonardo and Michaelangelo are captured by Dirk Savage, Donatello and Raphael are contacted by April and Irma. It seems that A. J. Howard at one time owned a Genetics Lab and disappeared for one year after it was abruptly shut down. What does it mean? The Turtles are about to find out. Donatello and Raphael contact Mondo Gecko and convince him to act as a decoy, and allow himself to be captured by Dirk Savage. Mondo Gecko does not hesitate to agree, as Donatello plans a homing device on him and sends him out on the street. Sure enough no sooner has Dirk captured Toka, then he captures Mondo Gecko, and drops them off at A. J. Howard’s secret hideout, where Howard reveals that he does not want to destroy the mutants – he wants them to serve as his troops. Unbeknownst to Dirk Savage, A. J. Howard is a mutant himself. Now he wants to take over the human race. Donatello reflects back on Splinter’s comment in Act One and devises a way to be captured by Dirk Savage, where they are able to convince the mutant hunter that they are the good guys, by saving his life against Razar. Meanwhile, April and Irma, while snooping around the secret new A. J. Howard building discover its real purpose – converting humans into mutants. After being contacted by April, Donatello, Raphael and Dirk Savage rush across town to stop Howard’s fiendish plot, rescue all of their mutant friends and live happily ever after – or until the next episode, whichever comes first.